Welcome to Florida-Everglades.info – Your premier online guide to the Everglades National Park Showcasing hundreds of exciting attractions throughout the south west Gulf Coast area of Florida including the neighboring communities of Naples, Chokoloskee, and Marco Island. The Everglades National Park has been designated a World Heritage Site, an International Biosphere Reserve, and a Wetland of International Importance. Established in 1947, the Everglades National Park covers 4,000 sq mi in southern Florida extending from Lake Okeechobee southward to Florida Bay. Federal Land comprises 1,398,617.13 acres, Non-Federal Land – 461.13 with the gross total area acres of 1,399,078.26. 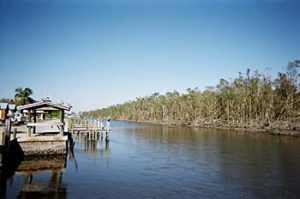 The Everglades is a unique ecosystem and is completely dependant upon water flow, making it one of the largest and most productive estuaries in the world. The Everglades support more than 350 species of birds and over 1,000 species of plants. The annual average rainfall of more than 60 in. (152 cm) with most falling in the summer. Big Cypress Swamp, to the northwest, and Lake Okeechobee are the chief sources of its water.